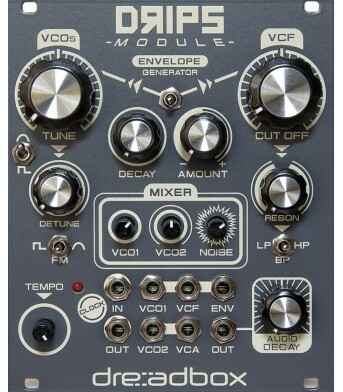 2 ADSR envelope generators with offset depth control, rate switch (fast-s..
High sound and build quality in an affordable price. If you like the sound of Erebus & M..
Dual Digital Parallel Lo-Fi Delay Wet output for both delays Time modulation for both delays ..
High sound and build quality in an affordable price. If you like the sound of Erebus & Mur.. Complete analog synthesizer designed for drum sounds2 VCOs with FM functionWhite Noise Generator3 mo..